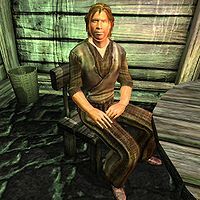 Baurion is a Breton ostler who can be found at the Roxey Inn, which lies north of the Imperial City on the Red Ring Road. He is quite a heavy beer drinker and will perform his favorite pastime every day at the inn's counter between 10am and midnight. He will then sit on the chair outside the inn for six hours while trying to shake off that blurry sensation in his head. At 6am he staggers back to his bedroll behind the inn building and sleeps there until 10am. He wears lower-class attire consisting of a coarse linen shirt and linens and a pair of stitched leather shoes. His only other possession is a leveled meager amount of gold. Esta página foi modificada pela última vez à(s) 05h17min de 20 de outubro de 2015.